It is safe to assume that the flood waters have penetrated every inch of the snow plow's electric/hydraulic system. When the flood waters recede, resist the urge to turn on your plow system to see if it works. 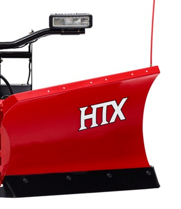 Turning on the system immediately may cause damage to the plow.Before turning on your snow plow, follow the steps below to determine if there has been any damage to your snow removal equipment. 1. Completely disconnect all electrical connections from the snow plow. 2. Open up the harness loom and flush out any debris. 3. Clean and inspect all electrical terminals. Replace any that appear damaged or corroded. 4. Hang the wiring harness in a heated, dry location until completely dry. 6. Once the wiring harness is completely dry, the harness can be reinstalled on the plow. 7. Disassemble the headlights and directionals, if possible, and inspect and clean all internal connections. Allow the connections to dry. Grease the terminals and reinstall. 1. Drain the hydraulic reservoir and remove the power unit from the snowplow. 2. Completely disassemble the power unit (reservoir, lines, pump, relief valve, fittings and motor). 3. Allow the electrical motor to completely dry out. Inspect the brushes and bearings for debris and clean if necessary. 4. Completely flush the pump, relief valve, breather cap, intake/return lines and reservoir tank. Allow the plow components to dry and then reassemble using new seals and gaskets. 6. Flush the aluminum manifold block. Discard any debris and allow the unit to completely dry. Using an air hose, completely blow out the manifold block. 7. Clean all valve screens and fittings. Remove any debris and using an air hose blow out the components. 8. Reassemble the valve manifold. 9. Remove all hydraulic lines and flush. Blow the lines with an air hose. 10. Remove and hang all the hydraulic cylinders so they can drain. If no water has penetrated the cylinder (milky fluid), reinstall the cylinder. If fluid is present, fully disassemble the cylinder, clean, install new seals and reassemble.